Guess how high these low clouds are? The lowliness of cumulus clouds is easier to recognize if there are mid-level clouds in the same sky. Take yesterday. The sky was full of smallish cumulus clouds--the puffy ones with gray shading in the photographs I have posted here--and, above them, patches of clouds that were clearly floating above them. The cumulus clouds rest at altitudes ranging from ground level to about 6,500 feet. I cannot estimate the height of other clouds. "Low" works fine for me. The higher clouds are a type of mid-level cloud known as altocumulus. (Yes, "alto" means "high," but meteorologically it means "mid"). Altocumulus clouds are found at altitudes ranging from 6,500 to 18,000 feet. "Mid-level" works for me. I will explain why at the end of this posting. I have zoomed in on the clouds here--take a look so you can get a better look at the two levels--the large gray and white cumulus below and the smaller, fleecy altocumulus above. Cumulus below, revealing patch of altocumulus above. Here they are again, even closer so you don't have to find your reading glasses. A heart-shaped cumulus cloud! It must have noticed me staring. It always takes my eyes and brain a while to see the depth of the sky, to see that what I might initially describe as "behind" is actually "above," to see the sky not as a celestial dome but a celestial sandwich. From our perspective on earth, the land we stand on is flat and the sky is flat. We cannot observe the curve of the earth nor the curve of the atmosphere that surrounds it. We do not live in a snow globe. Take a look at the photo below. These are cumulus clouds--cumulus humilis because they are wider than they are tall. The bases of all of these clouds--from the top right of the photo all the way back to the horizon point in the lower center of the photo--are resting at the same altitude. All of these clouds are the same height. Look again after reading this: as your eye moves from upper right to lower center, do not let the clouds sink down toward the earth. Keep their bases up there at the same level. Do not let the clouds and the earth touch at the horizon. You're getting it if you feel your eyes and brain arguing. Now, for the reason I have not yet mastered estimating cloud heights. I don't own a gizmo such as a lidar detector or a ceilometer (below). 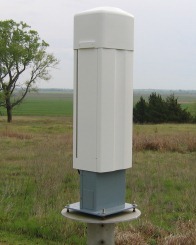 This ceilometer is used by the Atmospheric Radiation Measurement Program of the U.S. Department of Energy. And because knowing the height of cumulus clouds involves a formula that requires subtracting the dew-point temperature from the surface temperature and then multiplying by 125. You can remember this formula as as H = (T-DP) x 125. If you have a smart phone in the field, you can get the current temp and dew point from the NOAA website and probably do the math in your head. If you're not so equipped, you can find the numbers later on your computer. Like I just have. Yesterday at 12:51 p.m., when I took these photos, the temperature was 46 degrees F and the dew point 35 degrees F. (Recall that dew point is the temperature below which water vapor condenses). So, that's an 11 degree difference, multiplied by 125 equals 1,375. Voila. The cumulus clouds in the photos above were floating 1,375 feet above the earth. I will try to understand why this works and explain it all to you in an upcoming post. Look at the clouds! Do the math! Amaze your friends! Click here for NOAA website. Enter the zip code in the upper left for current conditions (including surface temp and dew point) in your area or wherever your cumulus clouds were hanging out. If your cloud photos are a few days old, use the link to "3 Day History" for the hourly temperature, dew point, and other data. In "altocumulus clouds", "cumulus clouds", "heart-shaped cloud", "how to determine height of cumulus clouds"